When you were young, did you sit on a sofa in your family’s living room, or did you call it a davenport, or a couch? Maybe the sofa was in a den, or a family room, or a conversation pit, where people sort of sprawled and talked? Surely you didn’t have a davenport in the parlor; not even my grandmother had a parlor! But she had a room to sprawl and talk, and it had a (horrible! stiff! scratchy! bumpy!) leather-covered, horse-hair stuffed sofa. It was not a davenport. Davenports were comfortable. 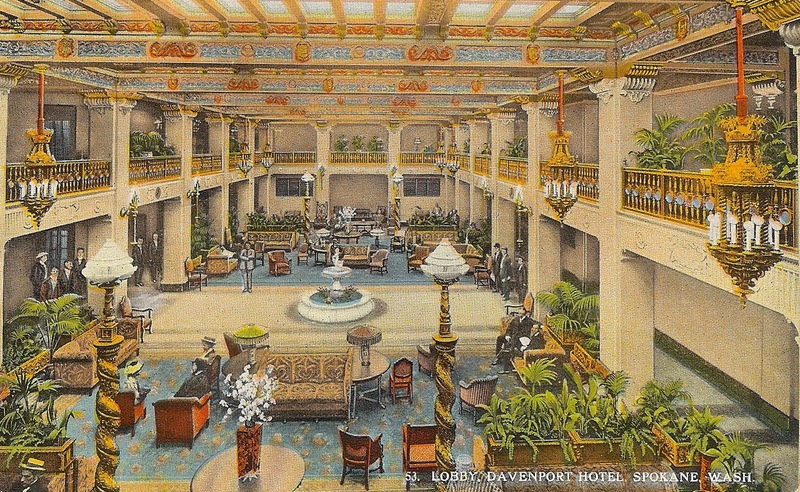 In the Pacific Northwest, the most elegant and comfortable Davenport was the Davenport Hotel in Spokane, Washington. I recently returned from the Pacific Northwest History Conference in Spokane, which was held at the Davenport, a hostelry that opened in 1914, closed in 1985, and was re-opened in 2002. It is a magnificent example of how renovating and revivifying a historic building can make a major contribution to the revival of an entire community, for the Davenport is once again a focal point of downtown Spokane’s social and commercial life. And it came mighty, mighty close to utter demolition. Louis Davenport (ca. 1869-1951) began operating a restaurant in Spokane in 1889, and it soon grew into a place of exotic decor and cosmopolitan dining pleasures. 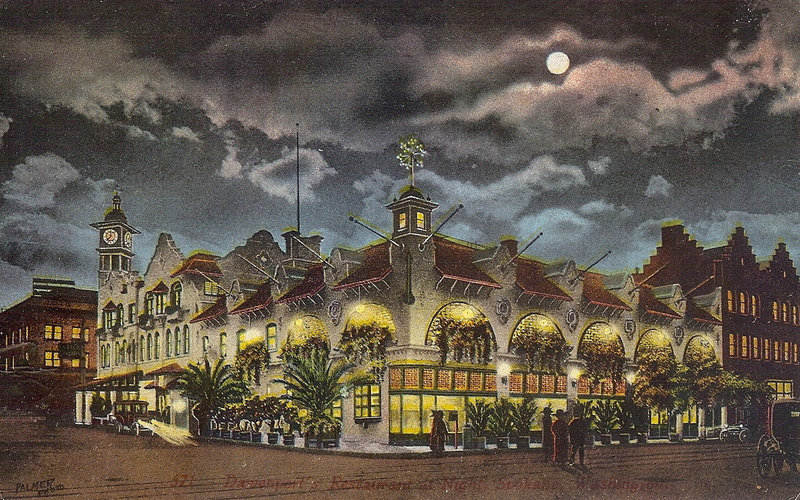 Davenport’s restaurant building in the early 1900s was an eclectic structure, sort of California Moorish Venetian, if you can envision such an amalgam. 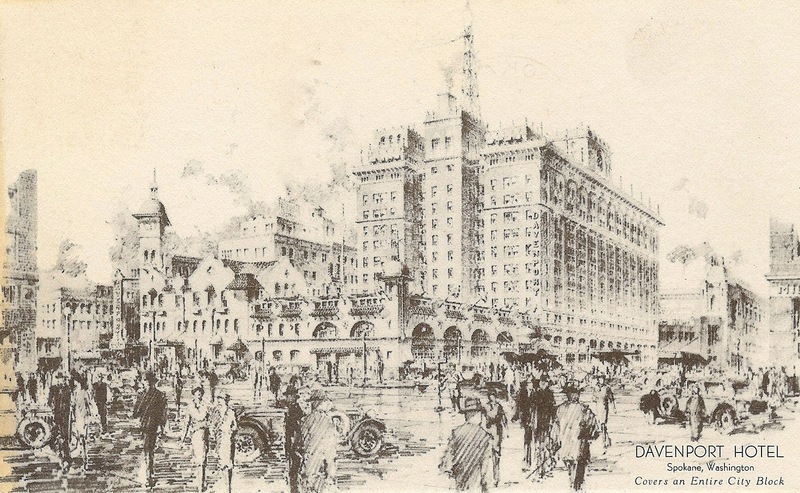 In 1914, Davenport added the management of a large hotel to his enterprises, which then comprised a city block; the architect of the hotel was Spokane’s noted Kirtland Cutter (he had also designed the restaurant; he was an exceedingly versatile designer). 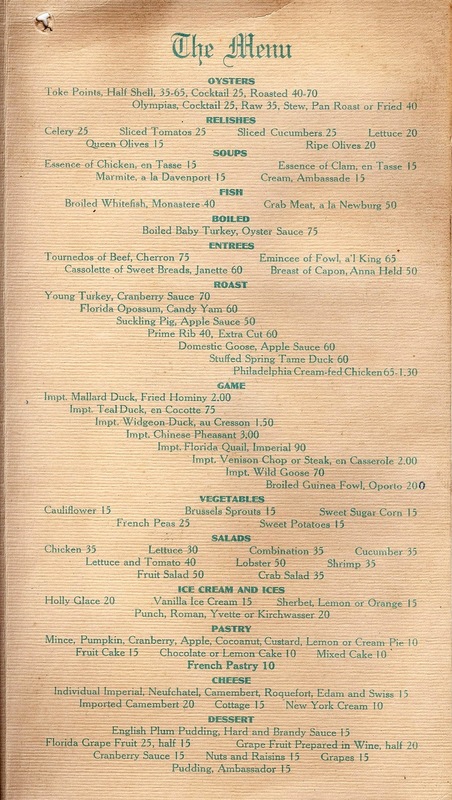 I recently acquired a menu from Davenport’s Restaurant, a special menu for Christmas of 1909: 101 years ago. The cover is a hand water color wash of poinsettia flowers, while the printed interior details the musical selections by Mr. Al. Thurston’s orchestra, as well as the menu. Dinner begins, of course, with oysters: Toke Points raw on the half shell, in an oyster cocktail, or roasted (from Willapa Bay’s north shore, probably raised from East Coast transplant seed), and the small, native Olympias, to be had raw, stewed, pan roasted, or fried (wild, from Puget Sound). Aside from oysters, whose relatively local origin is duly noted, many of the delicacies on this menu are pointedly brought in from points far, far away. Game is prominent, but it is all noted as imported: from whence, we know not. However, under “Roast,” we can see that the opossum is from Florida! Aren’t railroads wonderful! 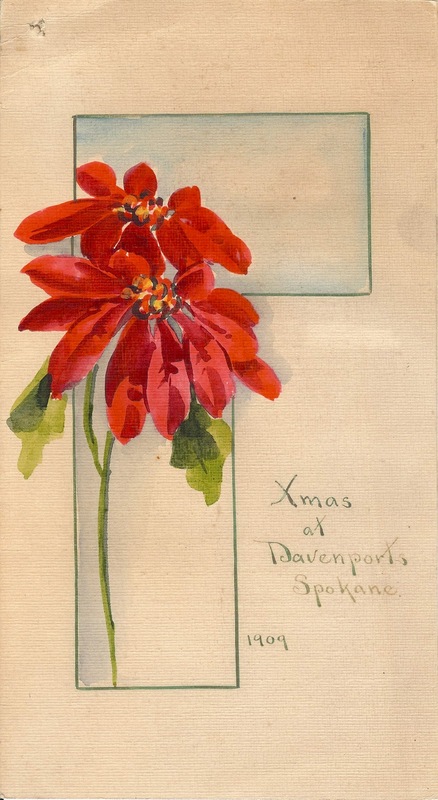 Winter holidays are perhaps not the best time to evaluate the extent and nature of local foodstuffs on a Spokane menu; those tomatoes, sweet sugar corn, and French peas were probably not available in any form other than canned, even to the redoubtable Louis Davenport. Christmas is a special time. The 63rd annual Pacific Northwest History Conference was titled “Game Changers & History Makers: Women in Pacific Northwest History,” inspired by the 2010 centennial of woman suffrage in Washington state. It was a celebratory event, and the Davenport was a distinctive place to hold it.